Click to see testimonials, or submit your own. Check a potential contractor's credentials and work history here. * As of current information, there are no tree removal permits required for Bothell. 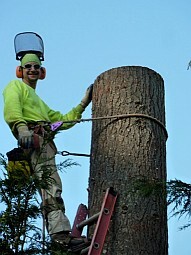 * A permit for tree removal is not usually necessary in unicorporated King County. These guys are the best! They took out five or six large fir trees for my mom and did a great job. They were knowledgeable, easy to work with and very warm and friendly. We loved them! Not only that, but when I asked them what they would charge to trim two very long fir trees from a neighbor's tree that were shading a corner of my yard, they came down to my house and cut them for free!!!! They offered advice on trees to both my mom and me. You do not find this kind of customer service anymore in ANY business!""